First, vampires were all the rage. Now, zombies seem to be limping their way into the limelight. 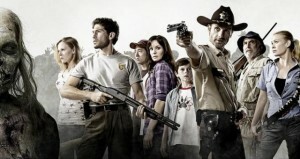 “The Walking Dead” premiered last Sunday night on AMC with the highest ratings ever in that channel’s history. And I see people praising and discussing it all over Twitter. So I decided that I needed to sit back and see what all the hype is about. Based off a comic by the same name, “The Walking Dead” is about Sheriff’s Deputy Rick Grimes (Andrew Lincoln) who wakes up in an abandoned hospital to a zombie apocalypse. He tries to come to grips with what has happened, all while he tries to survive. Grimes is determined to find his wife and son, who he believes are still *really* alive. The pilot episode “Days Gone Bye” starts the series off well. It is very engaging and suspenseful. (For being fairly imbalanced, zombies are good at sneaking up on people.) Also, the fact that it is filmed cinematically adds a realistic feel. The zombies look very convincing…and well, gross. The one he stumbles on to at a park in particular was disturbing. I liked that even though it’s a TV show, the producers didn’t skimp out on the makeup department. Those zombies looked legit. I hope I don’t have nightmares. Zombies have seemed to grow on me the past couple years. I used to despise them. But after being forced to watch “28 Days Later” and “Zombieland,” I realized that I kind of am taking to the whole zombie concept. So even if you are not a fan of the gross undead, I still recommend you check out this show. “The Walking Dead” airs Sunday at 10pm/9c on AMC.